Three artworks attributed to Pop Art icon Andy Warhol (Am., 1928-1987) – stylized renditions of the products Chanel No. 5 and Absolut Vodka, plus one of Elvis Presley as a gun-toting cowboy – combined for a little more than $50,000 in the sale. Press Release (ePRNews.com) - Franklin, Mass. - Mar 25, 2018 - Three artworks attributed to Pop Art icon Andy Warhol (Am., 1928-1987) – stylized renditions of the products Chanel No. 5 and Absolut Vodka, plus one of Elvis Presley as a gun-toting cowboy – combined for a little more than $50,000 in an online fine art auction titled Private Art Collections & Estate Discoveries held March 15th by Woodshed Art Auctions. Chanel No. 5 was the top earner in the 163-lot sale, selling for $32,400 (with buyer’s premium). The gouache, watercolor and ink on paper work was signed lower center and verso. It was also marked with the stamp “Contemporary Masters Exhibition” and reference numbers. The framed piece was possibly a study for Warhol’s series dedicate to logos, advertisements and trademarks. The rendering of the Absolut Vodka bottle, also a signed and framed gouache on paper, may have also been a study, for Warhol’s commission in 1985 for what became one of the most successful ad campaigns of the 20th century. It made $12,000. The Elvis image – a mixed media drawing on white paper, unframed – was felt pen-signed on the image and in pencil verso. It realized $6,000. The auction was packed with artworks from consignors in Europe, England, South America and the US, including original paintings and drawings by and attributed to noted artists from the 19th and 20th century, in styles that included Realism, Impressionism, Surrealism, Neo-Expressionism and Pop, a diverse mix of holdings from estates and fresh works from international art collectors. The second top lot of the auction was Illustrations of Tintin by Georges Remi Herge (Fr., 1907-1983), original ink drawings with pencil indications and white-out corrections on paper from the famous children’s book series ($21,875). The ink and watercolor on paper from Andre Franquin, the Belgian comic artist (1924-1997), of the character Gaston, artist signed, gaveled for $2,400. Following are additional highlights from the auction. Bidding was facilitated via the bidding platform LiveAuctioneers.com. People could also register and bid on the Woodshed website, www.woodshedartauctions (a new feature). All prices quoted include the buyer’s premium. Jean-Michel Basquiat (Am., 1960-1988), like his friend and contemporary Andy Warhol, was also represented multiple times in the auction. 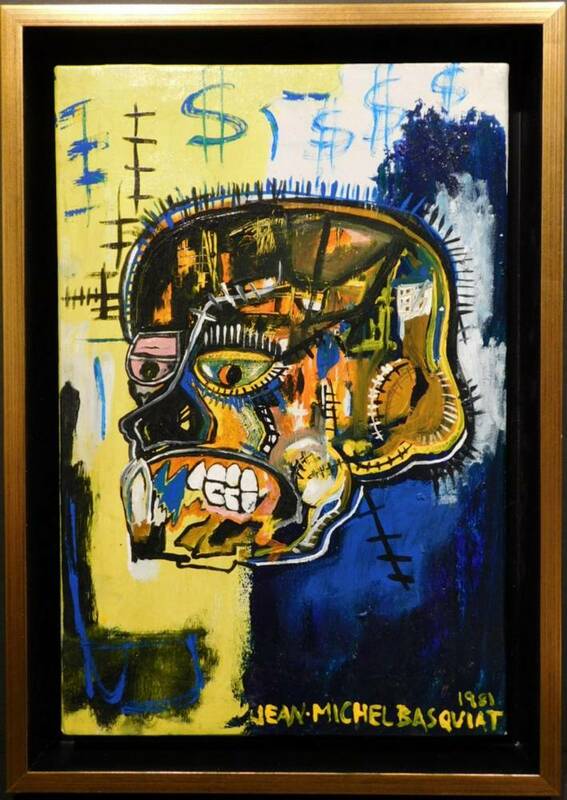 An oil on canvas attributed to Basquiat, titled Portrait of a Man (1981), artist signed and housed in a recent frame, brought $12,000. The 16 inch by 10 ½ inch painting, done in the artist’s inimitable style, came out of a collection in Spain. A pair of crayon on pulp board drawings attributed to Basquiat, signed on the reverse with the artist’s initials and trademark crown, sold as individual lots. Each one fetched $1,200. Both were small, just 5 ¾ inches by 4 inches, and were consigned by a collector in Illinois, who reported the drawings had been purchased by the previous owner on Bleeker Street in Manhattan, circa 1980. What is thought to be an early unfinished study for The Scream, one of the world’s most famous works of art, by the Norwegian painter Edvard Munch (1863-1944), hammered for $13,200. The work, an attribution, was signed and dated 1892. As the story goes, Munch created his haunting, symbolic painting The Scream after hearing an ear-piercing scream while on a walk with friends. Pen and ink drawings on both sides of a single sketchbook page, done in the manner of the Dutch Master Vincent Van Gogh (1853-1890), one titled Tree Study and the other one Landscape with Haystack, went for $9,600. Also, a tempera and oil on paper attributed to Claude Monet (Fr., 1840-1926), titled Sunrise, artist signed, 7 ¼ inches by 10 ¾ inches, unframed, fetched $7,200. Two paintings linked to noted French artists posted identical winning bids of $6,000. One was a tempera and gouache on paper work attributed to Henri Matisse (1869-1954), titled Room Interior, signed, 10 ¾ inches by 7 ¾ inches unframed. The other was an oil on canvas after Jean Metzinger (1883-1956), signed and dated (June 1918), 47 ½ inches by 39 ½ inches in the frame. An oil on canvas landscape painting (possibly of Old Lyme, Conn.), by Hungarian-American artist Maurice Braun (1877-1941), signed lower left and measuring 30 ¾ inches by 36 inches in the frame, garnered $4,800. Also, a watercolor and ink drawing attributed to the Spanish-born Surrealist Pablo Picasso (1881-1973), titled Bullfight, signed and dated “3/3/67”, made $2,400. An untitled oil on canvas painting attributed to Lee Krasner (Am., 1908-1984), the Abstract Expressionist painter who was married to Jackson Pollock, signed lower left, sold for $2,400; while a marker on paper attributed to counterculture illustrator Robert Crumb (Am., b. 1943), titled KOT (his iconic Keep On Trucking man), pencil signed and unframed, sold for $1,200. For more information about Woodshed Art Auctions and the firm’s April 26th online-only fine art auction, visit www.woodshedartauctions.com.